Welcome! I am a mom to two wonderful kids, a lovely retired greyhound, and a wife to a great husband. Needless to say, there are a lot of daily messes to clean up around our house. Daily Messes is my blog to share ideas on things to do with your kids, snack and meal ideas, crafts, and holiday fun. I hope you find something to enjoy! 1. 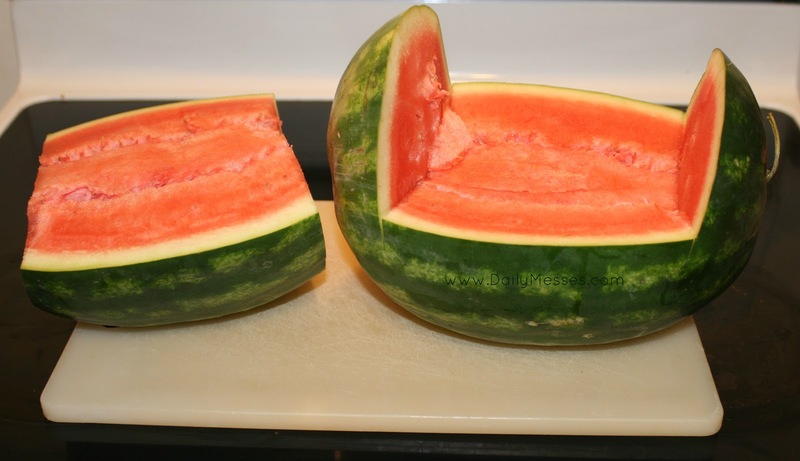 Cut out middle section of the watermelon. I cut a slit at both ends, and then horizontally in the middle. Make sure to leave both ends intact and to have high enough sides for the fruit salad to stay in the bowl. 2. Cut out (or spoon out) the fruit. 3. Carve a head and neck shape out of one of the ends. 4. Carve feathers out of the other end. I simply cut slits into the melon. If you want it be more turkey-like, you can carve rounded slits for the feathers. 5. Using a sharp of a knife (I used a paring knife), carve out the eyes. I just carved out the green layer and left the white layer intact. Set aside. 6. Next, take the middle section you cut out in Step 1. Cut the fruit off of the rind, but leave some of the red on the rind. 7. Cut out a beak shape. I just did a triangle and trimmed off the red fruit. 8. Cut out a wattle shape. My watermelon and a very thick rind. I ended up trimming off the green part of the rind so it would fit better on the head. 9. Optional: Cut additional feathers from the middle rind section. 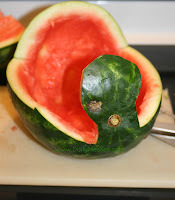 Attach to tail part of the watermelon with toothpicks. 10. Attach the beak and wattle with toothpicks. I cut my toothpicks in half so that they would not stab anyone trying to reach into the fruit bowl. 11. 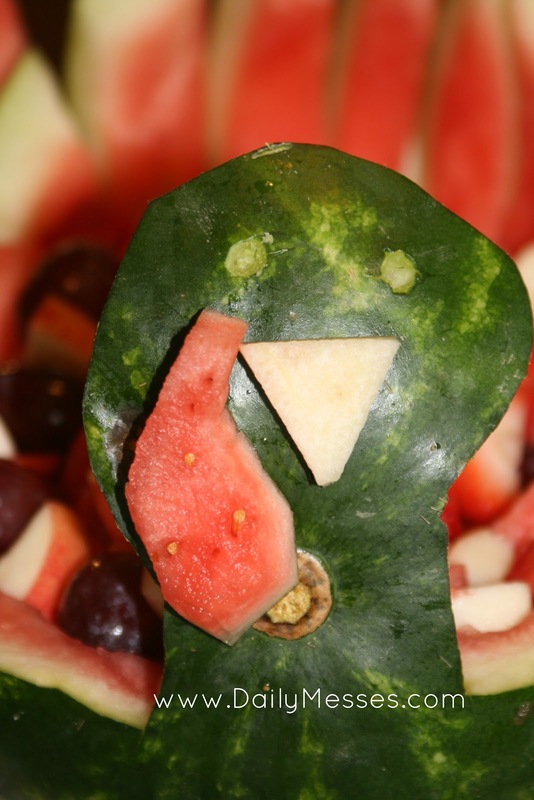 Cut up the watermelon and any additional fruit. Fill the bowl and serve! 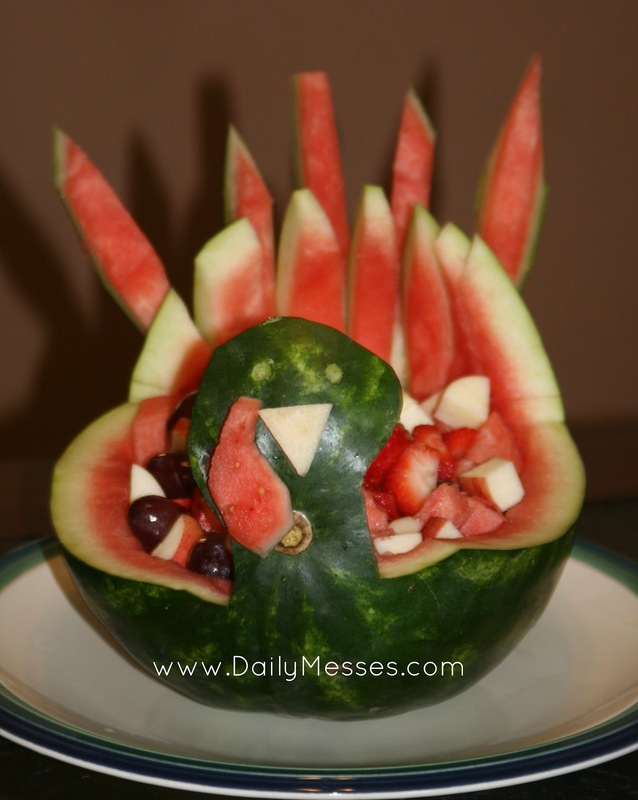 What a great idea for Thanksgiving!! I love to hear from you! I promise I read every comment, but I don't always remember to respond to each one. All content, pictures, etc. are property of Sarah Tepe @ www.DailyMesses.com and are not to be used without written permission. If you are interested in purchasing ad space, please contact me at cake_star_mom@yahoo.com! Sarah Tepe. Simple theme. Theme images by suprun. Powered by Blogger.